2nd Suite for Military Band dedicated to bandmaster James Causley Windram (1886-1944) was composed in 1911 and was Holst’s second composition for Concert Band. To distinguish the 2nd Suite from a Brass band, the designation Military band was used (i.e., in addition to brass instruments, woodwind and percussion instruments were employed) - what would today be referred to as a Concert Band or Symphonic Band. In 1909, when the 1st Suite in E Flat (Op. 28, No. 1) was composed, there was no standard instrumentation for a Concert Band, so Holst scored the work for 19 instruments with 17 additional “ad lib.” parts (meaning, the piece could be performed without them) but even the original 19 included some instruments which are now obsolete (Db Flute & Piccolo and Bombardons - an early type of tuba). 1. March, after a five note motif, contrasting high and low instruments, begins with Glorisgears, a traditional Moris Dance tune (3-45), followed by Swansea Town (46-110); the Trio presents a change in tonality (from Concert F to Bb), modality (from major to minor) and meter (from 2/2 to 6/8) ) with Claudy Banks (111-159) then the standard Da Capo. 2. Song Without Words uses I’ll Love My Love in F minor - Dorian, although Holst uses the traditional key signature of four flats for F minor (rather than three for F minor Dorian). 3. Song Of The Blacksmith uses the folk song A Blacksmith Courted Me, constantly changing meter from 4/4 to 3/4. The scoring of the Brass throughout (parallel fourths, etc.) hints at techniques which Holst employs in later works such as The Planets. The percussion part also calls for an Anvil (undoubtedly popular with percussionists as an easy item to carry around). 4. Fantasia on the ”Dargason” uses two tunes from Playford’s Dancing Master (1651): Dargason (an eight bar tune in 6/8, also known as Sedony, Sedany or Welsh Sedony) and Greensleeves (in 3/4). Holst used this movement the following year in his St. Paul’s Suite (for String Orchestra). In this arrangement as a Sonata for Alto Sax and Piano, as much as possible of the Solo Alto Sax band part has been retained and the part has been marked to indicate the original source (Woodwinds, Brass, etc.). 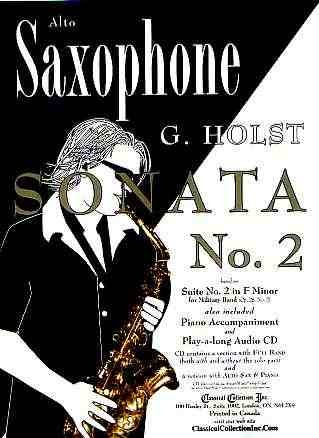 This makes the Sonata ideal for any saxophonist who is studying or performing the 2nd Suite, to better play, understand and, in general, enjoy the wonderful music of this outstanding piece!